What happens when you create a mess of the popular SEO strategies? The tactics go out to hurt you in place of helping you. That is probably the last thing any strategist or engineer wants to do with their time, money and effort. Most of them nurture the best practices and try to modify the websites so that the pages and the content rank in the visible regions of the Google SERP. However, lately, it seems like SEO has a mind of its own. It diverts the strategies against the websites and pours cold water on all our ranking hopes. Speaking to the experts at tayloright.com has helped us compile a list of the top 10 mistakes almost all webmasters are making right now in their efforts to optimize their sites. “Buy gaming keyboard” and “gaming keyboards on sale” might seem very similar in grammar but the shopper’s intentions can be entirely different on the part of the user. You need to understand the nuances of keywords and key phrases that your searcher may use that can lead them to your website. Using keyword tools like Ahref can help you find out exactly what your potential customers might be looking for right now. While you are at it, do not forget to pay due attention to the LSI keywords. They can act as powerful traffic magnets too. All of us like to believe that websites rank on Google search results due to a smart collection of keywords. However, keywords are NOT omnipotent, and they do need a little help from their “meta” friends to work. So always focus on your meta descriptions and title tags before you can declare your SEO strategy as complete. Not only does the title tag and meta description tell the human users all about your site, but they also serve as a “map” for Google bots to crawl. A slow website is a dead website. That is the ultimate truth of the digital century. No company can survive the backlash of a slow loading site. When your website is slow, it can hurt your domain. Users do not have the time to hang around for 7 to 10 seconds for a page/site to load. You can try GTmetrix to test your website speed. Always be sure to keep the loading time around 3 to 4 seconds for a standard site. Not all essential data are good-looking. You need to be able to read and analyze your website data for understanding its performance. It is quite normal for website owners and even engineers to ignore the analytics when their new SEO strategies perform well. However, in this case, you must always check your analytics data first to understand the lack of optimization in spite of dedicated SEO effort from your team. Google Analytics is undoubtedly the best tool that serves a hot dish of user behavioral data sprinkled with a garnish of CTR, bounce rate, dwells time and conversion rates for every eager strategist and engineer. Content is necessary to rank higher, but the quality of your content will take you much further as compared to the quantity. Many of us fret about the slow rate of content generation or the lack of a dedicated content team and try to fill our site with poor content that does not attract bots or human users. Your content simply needs to be high quality. You must remember that publishing less frequently won’t hurt as much as publishing terrible content. Once you get the hang of your visitor’s taste, you will find it much easier to strike a balance between the quality and the quantity of content. Cheap hosting may seem to save a few bucks, but at the end of the day, it is undoubtedly going to cost you a lot more. Free hosting and cheap hosting often club a lot of websites together on the same domain. Sometimes, you will end up sharing your domain with hundred other sites of questionable reputation. That’s why private hosting is the smarter option, although the pocket pinch might hurt you a bit initially. If there’s something that hurts more than a bad choice of backlinks, it is a flurry of broken links on your site. Use tools like ScreamingFrog to crawl your site and find out links that need immediate attention. Having a lot of broken links raises some red flags when Google bots crawl your site. Damaged links can weigh your site down and keep it from soaring to higher ranks. 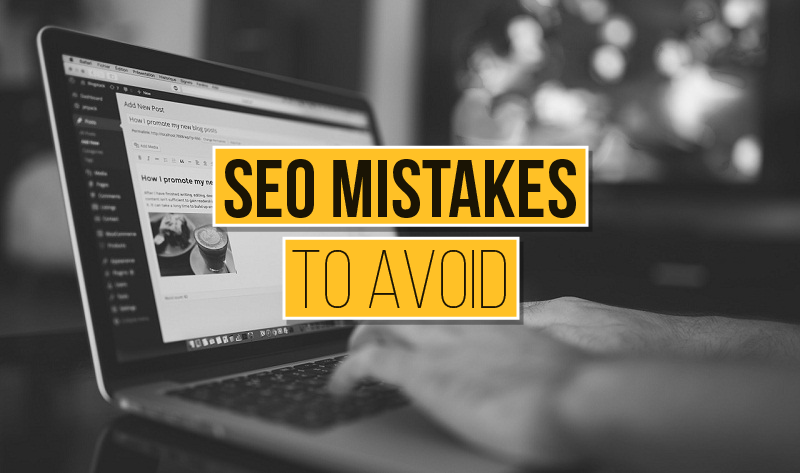 These mistakes are apparently very simple, but even the best of the best strategists and SEO experts miss them sometimes. In case your site is not doing so well on the SEO front today, go ahead and give these seven factors a check! This article is written by Maria Jones, who is an SEO expert and blogger. She has been working with leading companies including tayloright.com to document the SEO trends according to the new Google search engine updates of this decade.